The addition word problem worksheets presented here involve performing addition operations with regrouping and without regrouping. 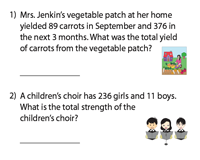 Our extensive and well-researched word problem worksheets feature real-life scenarios that involve single-digit addition, two-digit addition, three-digit addition, and addition of large numbers. Free samples are included. These printable practice worksheets involve simple addition of single-digit numbers. Read the word problems and perform addition operations to arrive at the answers. 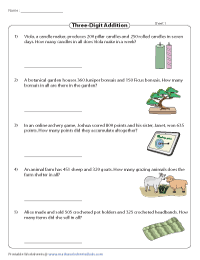 Featured in these worksheets are engaging word problems whose sums add up to 20. Addends may have a combination of single-digit and two-digit numbers. 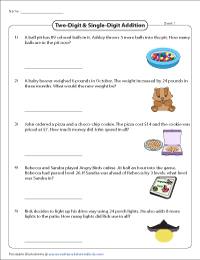 A number of real-life scenarios in the form of word problems featured in the addition worksheets here involve single digit and two-digit addends. The word problems in this section do not require regrouping or carrying. Find the answers to the word problems that feature two-digit addends. All two-digit addition word problems presented in the worksheets here require regrouping (carry over). Follow the place value columns to sum up the two-digit addends. 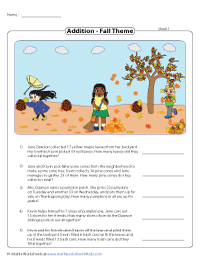 Presented here are worksheets with three colorful themes - Fall Season, Aquarium and Theme Park. Read the questions and solve the word problems. Answer keys are included. 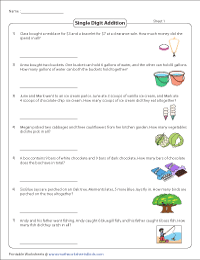 A total of 15 addition word problems spread over three PDF worksheets presented here require you to sum up three-digit addends with the two-digit addends. Enhance your arithmetic skills. 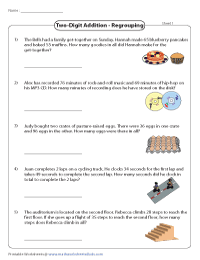 Read the word problems to sum up three-digit addends in these worksheets. Some problems may require regrouping. Answer key included in each worksheet. The word problems presented in the worksheets here feature large numbers with addends up to eight digits.